Technical Analysis and Elliott Wave Theory: Elliott Wave Update Week 45 2009 ~ Spot on! SPX: As expected last weekend, the market had a pretty good week and hit my short zone around 1070 on Friday. Thus, I think Minor 2 is in its final stage or has already finished at 1071. As mentioned in the chart, Minor wave 3 should end in the mid 900's making it 1,62 times Minor wave 1. 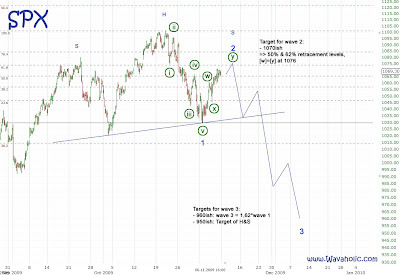 After that, Minor wave 4 and 5 should follow and complete Intermediate wave (1) around 900.